Every year we record our Summer School closing concert. This year’s special 10th Anniversary concert was on 12th August at Kings Place. It was the climax of the Summer School held in Purcell School Bushey, Herts. 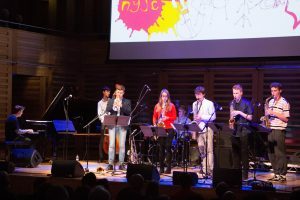 The bands had worked together for a week with tutors who helped them develop an understanding of each piece and then create an original arrangement which they perform here. This year’s reportoire came entirely from British composers as we are celebrating 100 years of recorded jazz in the UK. We were even privileged to have one of the composers, Sir Karl Jenkins in the audience to enjoy a rendition of his composition Lullaby for a Lonely Child. These are now ready for everyone to enjoy! You can see them all here as a playlist.